These Golden Haired Angels will make beautiful package decorations or a choir of heavenly angels to decorate with for the holidays. 1. Print out the pattern and glue it onto a cereal box. 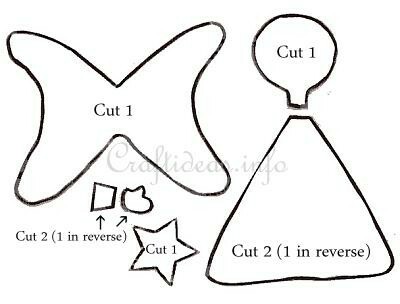 Then cut out the shapes to create permanent templates that can be easily traced around. 2. Trace the templates onto the proper colored card and cut them out. 3. Sandwich the head between the two body parts. 4. Glue the star on what will be the front of the angel. Then glue the two arms and the two hands first together and then onto the star so that the arm is perfectly lined up with the body edge. It has to look like she is holding the star. See picture. 5. Glue the wings onto the backside of the body. 6. Draw a friendly face on the angel. 7. Take a few strands of gold yarn that are about 15 centimeters long (or length of choice) and tie the group off in the middle. Then glue this middle onto the center top of the head. Trim the ends of the hair if necessary. This craft is reprinted courtesy of craftideas.info where you will find beautifully executed crafts for all ages. Print out the pattern and enlarge it on a copier. Most copiers have an enlargement feature.